If you're in charge of Thanksgiving, there is a lot to manage from planning the dinner menu to decorating your home. A holiday shopping list can help you stay organized and make sure you have everything you need to create the perfect holiday. This Thanksgiving shopping list includes the ingredients you need to make a traditional Thanksgiving dinner. It covers popular Thanksgiving recipes such as mashed potatoes, sweet potato casserole, green beans with almonds, stuffing, pumpkin pie, and pecan pie. It also includes tablescape and decorative items. Use the blank space at the bottom of each category to add a missing item. If you need more blank spaces, click on the plus sign next to the item. This will create a new blank space just below the line where you clicked the plus sign. To remove lines and items you don't need, click the minus sign next to the item. Be sure to check your pantry to see if you have any of items on the list before heading to the store. Each line is editable, so you can add and remove items and make notes as needed. Consider including the amount to buy, brand name, or reminder to use a coupon. Once you tailor the list to suit your needs, you can print it. If you need help downloading and printing the list, check out some Adobe printable tips. Check the box next to each item once it has been purchased. Click to download and edit the shopping list. Preparing for Thanksgiving leaves many people overwhelmed. As a result, they spend the holiday stressed instead of enjoying time with family and friends. 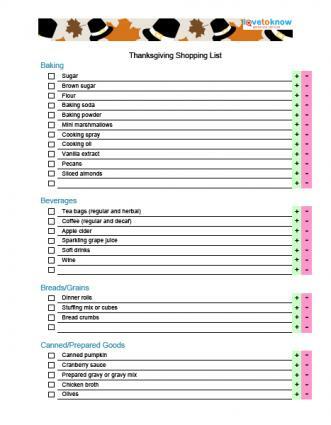 Doing what you can ahead of time to make sure all bases are covered, like making a Thanksgiving shopping list, helps you stay focused and on track.